We are now 5 point dogs with the over/under at 165. If I am not mistaken, and it has been awhile, Blizzard had a flu against Drexel in Phily and tore the house down. Maybe lightening can strike twice! WILMINGTON, North Carolina – The UNCW men's basketball team heads up to the mid-Atlantic region of the eastern seaboard this week for a pair of Colonial Athletic Association road contests against league upstarts Drexel and Delaware. The Seahawks (8-16, 4-7) kick off the road swing by battling the Dragons (11-13, 5-6) on Thursday night in Philadelphia in a rematch of a game claimed by UNCW, 97-83, on Jan. 12, 2019, at Trask Coliseum. Live Seahawk Digital Network (SDN) coverage of the UNCW-Drexel contest begins at 6:45 p.m. with Mike Vaccaro, the "Voice of the Seahawks," on the call. Visit UNCWsports.com/SDN for live audio and video coverage. A radio broadcast of the game may be heard on 95.9 FM "The Breeze" | WKXB HD 2 – 95.9 FM and 99.9 HD2 and live stats are available at UNCWStats.com. UNCW will be trying to break out of a three-game skid, including a 104-95 defeat to James Madison in the annual homecoming game last Saturday at Trask Coliseum. "Each game, there's something a little different that hurts us," said C.B. McGrath, UNCW's second-year head coach. "All in all, we just have to get better and get more consistent. We need to build the habits back up that we had early on. We've gotten back to the basics this week." Senior forward Devontae Cacok (Alpharetta HS/Riverdale, Ga.) continues to enjoy an outstanding senior campaign. The talented Georgian is averaging a double-double of 15.7 points and 12.2 rebounds, with 18 double digit rebounding games in 2018-19. He has recorded a double-double in all 11 conference games this season. Cacok ranks first in the nation in double-doubles (18), first in total rebounds (292) and third in rebounds per game (12.2). Teammate Kai Toews stands second in assists with 7.8 dimes each contest from his playmaking spot. Junior forward Jeantal Cylla (13.6 ppg, 4.5 rpg) and sophomore guard Ty Gadsden (11.5 ppg, 2.5 apg) give the Seahawks two other offensive options in the lineup. The improved Dragons, averaging 77.2 ppg, feature all five starters in double figures. Troy Harper (15.9 ppg, 2.9 rpg), Alihan Demir (13.9 ppg, 6.8 rpg), Trevor John (12.3 ppg, 2.5 rpg), Camren Wynter (10.6 ppg, 4.8 rpg) and James Butler (10.0 ppg, 7.9 rpg) account for the lion's share of Coach Zach Spiker's attack. Drexel is coming off a 67-63 road win at Elon last Saturday. The Dragons stand 7-4 at home this season and have won three consecutive games in Philly. THE SERIES: The Seahawks own a 20-12 advantage in the 32-game series. UNCW has captured seven in a row and eight of its last 10 meetings with the Dragons. During the seven-game winning streak, the Seahawks have averaged 88.0 points per game against the Dragons. 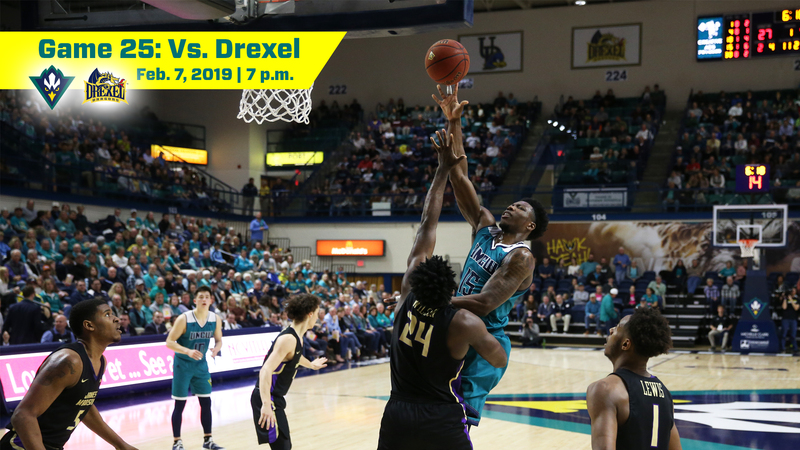 UNCW VS. DREXEL AT THE DAK: The Seahawks and Dragons have won seven games apiece in the 14-game series at the smallest outpost in the CAA. However, UNCW has won three in a row in Philadelphia. CLEAN SLATE: The Seahawks are 5-0 against Drexel second-year skipper Zach Spiker after sweeping the Dragons in 2016-17 and 2017-18 and taking the first meeting last month in Wilmington. BALANCED OFFENSES: Both of the clubs feature balanced scoring attacks. The Seahawks have six players averaging 7.8 ppg or better this season. Five Dragons are collecting at least 10 points or better this season. NEXT UP: The Seahawks make the 44-mile trek down to Newark, Del., on Saturday for a 7 p.m. tip-off against Delaware's Blue Hens. EVERYTHING SEAHAWKS: For more information on the UNCW men's basketball team, visit UNCWsports.com and click on the men's basketball button. Additional information is also available on UNCW's social media channels: Facebook (UNCW Men's Basketball), Twitter (@UNCWmenshoops), Instagram (UNCWBasketball). "each game there is something a little different that hurts us", No, No coach there isn't! We are 4.5 dogs with over/under at 163. With Teows sick, you really need to keep Cacok at the hotel so you dont risk him getting sick. He is too important to the success of UNCW to risk playing him tonight and being around another sick player. (02-07-2019 12:32 PM)dan10 Wrote: With Teows sick, you really need to keep Cacok at the hotel so you dont risk him getting sick. He is too important to the success of UNCW to risk playing him tonight and being around another sick player. Uh huh. I'll pass that concern along to the coaching staff, for sure. concern led to drexel being the recipient of the SIB Day prize back in the Blizzard era in Richmond. Such heartfelt concern! Ha. I tried with both of my posts to lighten your mood over here. Figured someone would at least crack a smile during your dark season. But seriously, Cacok can't graduate faster. He has crushed our souls for his career. If Toews does not play I do think we can win this one, if Toews plays, even in restricted minutes, I think you guys win a close one. UNCW is just a bad matchup for us. (02-07-2019 02:58 PM)dan10 Wrote: Ha. I tried with both of my posts to lighten your mood over here. Figured someone would at least crack a smile during your dark season. I laughed. I was just trying to respond like a smartass. Hard to convey both over the internet at the same time. (02-07-2019 02:58 PM)dan10 Wrote: Ha. I tried with both of my posts to lighten your mood over here. Figured someone would at least crack a smile during your dark season. But seriously, Cacok can't graduate faster. He has crushed our souls for his career. What's this "mood" you speak of? Our mood usually always improves after a Drexel game. Stop raining on my inter-conference smack talk. Geeeez. We JUST lightened the mood. It was conveyed fine. It came across as thick as C.B McGrath's defensive coaching strategy.